It happened just like in a movie. Mr. Demott visited Manhattan Orthopedic Care because of the painful rotator cuff injury. His visit ended leaving us inspired and motivated to continue helping, not only our patients, but other people as well. In Mr. Demott we see more than a patient and a friend. We see a hero! A while ago, when he was visiting Dr. Armin Tehrany to share an uplifting video testimonial, he also shared with us his inspirational life story. One year ago, he lost his 21 year old daughter in a sudden and unexpected accident. The loss of a child is of course unimaginable. The only comfort he was able to find was in channeling his grief into a positive endeavor to help others. Thus, Tony began raising awareness about a disease called Neurofibromatosis, a genetic disorder that affects nervous system function, neural cell growth, and the skin, afflicting over 100,000 people in the United States. Tony now helps in fund raising activities for research to find treatments for children with this disease. That’s why he signed up for the Ironman Florida with the Children’s Tumor Foundation’s NF Endurance Team. Mr. Demott also shared a letter, in which he encourages us and everyone else to contribute to a campaign that he is helping to champion, in order help alleviate the pains endured by patients with Neurofibromatosis. As Tony lost his own daughter too young, he knows personally what it would mean to save a life. About 3 years ago you performed rotator cuff surgery on me that, quite frankly, was miraculous. Following the physical therapy regimen, all pain was gone and full range of motion restored. As an endurance athlete this was crucial and I am overjoyed that I have experienced no pain whatsoever. Now I am on a mission and hoping that you will be a part of it. Following the death of my 21 year old daughter on Staten Island last year, I’ve resolved myself to fight in whatever way I can to be certain that another family doesn’t endure the pain my family has. I’ve signed up for Ironman Florida with the Children’s Tumor Foundation’s NF Endurance Team. I know you might think that swimming, biking and running 140.6 miles is crazy, but making a difference in the lives of families that live with neurofibromatosis each day will be life changing. Neurofibromatosis causes tumors to grow on nerves throughout the body and can lead to blindness, bone abnormalities, cancer, deafness, disfigurement, learning disabilities, and excruciating and disabling pain. NF is under-recognized and under-diagnosed, yet affects more people than cystic fibrosis, Duchenne muscular dystrophy, and Huntington’s disease combined. The Children’s Tumor Foundation funds critical research to find treatments for NF which is also shedding new light on several forms of cancer, brain tumors, bone abnormalities, and learning disabilities, ultimately benefiting the broader community. I am dedicating the training and the event to 8 year old Dakota Anderson – an incredibly brave young girl who has suffered through chemo treatments, surgeries and constant medical care. Thank you very much for your support. Dr. Armin Tehrany is more than happy to support the cause. Without any hesitation he made a heartfelt donation, hoping to help the research programs and support Mr. Demott’s efforts. 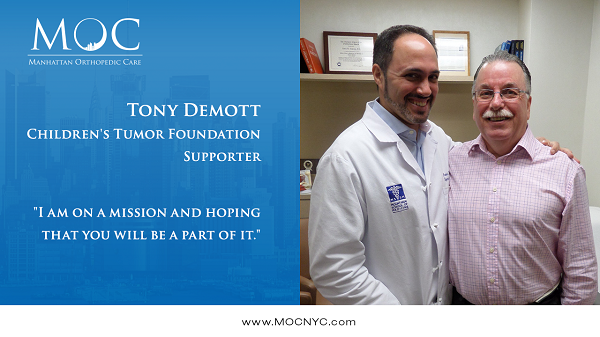 “Tony Demott is a very special patient to me as he is a wonderful and caring family man. I was deeply saddened to hear of the loss of his daughter and both respect and admire his dedication to raising funds for the Children’s Tumor Foundation. Neurofibromatosis is a devastating condition and disease and when I heard that I could help Tony- that I could be in the position to support his cause- I was thrilled, and I will continue to do anything in my power to help him and any family members of his. If we can ban together to promote awareness and help make people’s lives better and prevent this from happening in the future, all the better. He has all my best wishes and I look forward to continuing to connect with him and support him in the future.” says Dr. Tehrany. Friends of Manhattan Orthopedic Care, if you are moved by Tony’s story as we were, you can make a donation to the Children’s Tumor Foundation to support Tony’s efforts. In doing so, you help fund research and provide information, programs, and services for the millions worldwide who are diagnosed with neurofibromatosis. In this New Year and during a month dedicated to cherishing our loved ones, we wish you many blessings for spending precious and quality time with your own families. Likewise, we remember those who can benefit from our support during challenging times. Thank you in advance for your efforts to help the cause!